When you say Philippine National Red Cross, you think of blood-letting activity, first aid and charity. 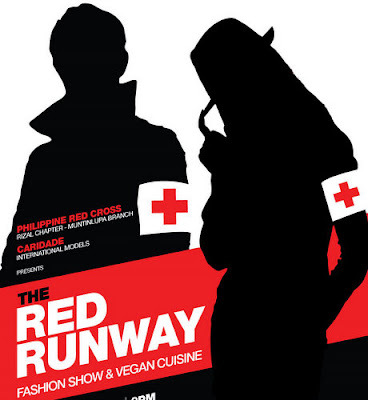 But this time around, Red Cross gave a different meaning and cause in its name, as Caridade International Models partnered with Philippine National Red Cross and brought The Red Runway: Fashion Show and Vegan Cuisine held last Thursday (September 29th) at 7th High in Bonifacio High Street in Taguig City. The event aims to raise fund and proceeds will go to a nutritional feeding program for malnourished children in Muntinlupa City (facilitated by the Philippine Red Cross Muntinlupa Branch and Kabisig ng Kalahi). The feeding program would also include seminars to the parents on how to come up with inexpensive, yet nutritious foods. Red Cross aims to deliver at least 150 children from the scourge of malnutrition with 1 hot meat for 5-6 days per week for 6 months. I have to thank my friend Enzo from Juan Manila Express and Migs Palacios for putting me on the guest list. I was actually kind of worried, because the staff who was manning the registration booth was not very familiar with my contact person, and I was even surprised that our names were not listed in the Guest List. But they were nice enough to accommodate me and even nicer to share the Red Cross advocacy with me while we wait for the program to start. I was clueless that kilometres away from where I was, another blogger was faced with the horror of dealing with a "not-so-accommodating" PR/publicist who refused to entertain him/them simply because they are not on HIS list. Tsk. Anyway, I was actually just planning to swing by the event, check out the collection and take some pictures. 7th High served alcohol drinks but for those who have deeper love for helping and giving, they could order the Red Alert Carafe. Unfortunately for me, I couldn't drink alcohol because I had to go back to the office (yes, I just took an extended lunch break, and thanks to my boss and my boss' boss for understanding this rather crazy schedule that I have). I just drowned myself with Iced Tea as we listened to the house music. The event was hosted by JM Rodriguez and (the fierce) Bianca Valerio (I super love, love, love this girl!). Julia Sniegowski and Marianna Henud, (two of the founders of Caridade International Models, along with Akihiro Sato, Hideo Muraoka and Janet Emmrich) shared a small talk on how passionate they are about helping the Philippines. To help raise funds, BlackBerry Curve, Ipad 2 and Mizuno shirt (signed by the Azkals team) were auctioned that night. It was nice to see fashionable people bidding for these things with the aim to help and give to charity. Then the catwalk was opened and came down the Caridade models in Folded and Hung collection. The event was short and simple, and it has attained its goal. Glad to be part of something that is not just about pure glitz and glam! Congratulations to the Caridade International Models, Philippine Red Cross and the organizers. Please like the Caridade Group Facebook Fanpage and RedRunway Facebook Fanpage.